The Grow A Farmer Initiative is deeply invested in community development, and with interest in widening our network of existing new and aspiring organic growers, organizes regular activities that help new farmers make connections, friendships, partnerships, and more! These events have involved regular farm-tours, mixers and other activities, such as the Beginner Farmer Symposium, to unite new and aspiring growers in knowledge, experience and inspiration. 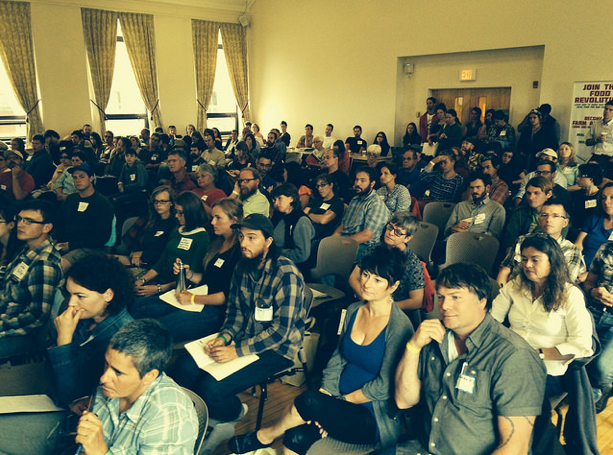 From 2012-2014, ACORN’s Beginner Farmer Symposium is an event that has celebrated and brought together new and aspiring farmers from across Atlantic Canada. The day features diverse and inspirational workshops and discussions covering critical topics facing our next generation of growers, plus many other activities, including Yoga for Farmers, a Small-Tools Show & Tell, Seed Swap, and more! The Symposium also features a dynamic trade show representing certification bodies, seed companies, extension service and various businesses available to organic producers. This has been a wonderful summertime opportunity to connect with other farmers and farming-dreamers and support the future sustainability of a local organic food supply. To review notes and resources from our previous Symposiums, please see here for 2014 (coming soon), here for 2013, and here for 2012. Past guest-speakers have included: Jean Martin Fortier, Les Jardins de la Grelinette/The Market Gardener (QC); Severine von Tscharner Fleming, The Greenhorns/Agrarian Trust (NY); David Alexander, Everdale Farm (ON); Sara Dent, Young Agrarians (BC) and Daniel Brisebois of Tourne-Sol Cooperative Farm (QC).